John stops us on our walk to ask after Coyote. We pause, and I fill him in on her slow, drawn-out deterioration. “They’re a super-breed,” he says, pointing at Coyote with his chin. And it hits me, full-force in the chest: Huskies are the closest that domestic dogs come to wolves. They’ve retained many of the wolf characteristics throughout their journey from fire pit to fire place. One of those characteristics is a kind of “famine mode” for absorbing nutrients from their food. My god, her genetics are prolonging her death. My dogs have all loved to run off-leash. Living in the city, the opportunities to do so are few and far between — and are often stolen at odd hours or in what most people would call “bad weather” so as to avoid being caught and fined. The Golden Retrievers in my life loved to stretch their legs and run for the sheer joy of it. 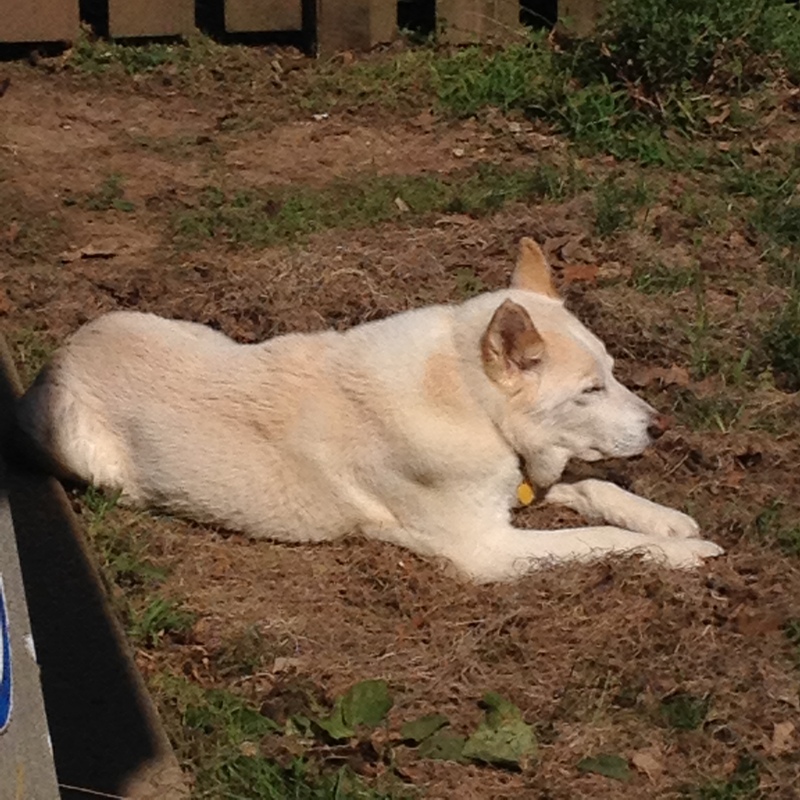 My Coyote, though, could simply never believe she was untethered, having spent her previous life chained to a post. Of the three dogs who have graced my adult life, she has always been the most grateful for that small freedom. As Coyote has grown weaker in her illness, I’ve started walking her up and down the street without a leash, knowing that she is too sick to run away and believing that I was doing her a kindness by allowing her to make her careful way without the tug of the leash on her collar. From time to time, I’ve caught her suddenly jerk to attention, seeking me out, so I’ve stayed relatively close and within her narrowing range of sight, thinking that was enough. Tonight’s walk gave me a different perspective. As we rounded the corner in front of my house, Coyote stumbled over the crumbling road surface. She hesitantly struggled over the rough spot and continued unsteadily on for a few steps before stopping and gazing up at me, tremors running through her poor old body. She seemed to want to lean on me, and I thought, I wonder if she feels lost. “Do you want your leash?” I asked her. She dragged a few, insecure steps toward me. “Would it help you if you had your leash, baby girl?” I closed the tiny gap between us, and she stretched her neck out in that familiar gesture that, for more than a decade, has signaled she wanted me to clip her leash to her collar for a walk. Only, now, there was another layer of meaning: I need to feel attached to you. I feel unsafe without my moorings. We walked on for the short way her paws will still carry her, and I noticed that when she stumbled or when her hind paw clubbed up because her brain can’t command it consistently anymore, she would glance up, leaning into her end of her leash so she could feel me on my end. Sometimes, if the leash hung too loosely, she would cast about with her head, relaxing only when she felt certain I had hold of her. And at the end of our walk, once we were safely in the yard, I unclipped the leash, as is our habit, and tried to coax her into following me up the hill to the house. She froze in place, waiting for the reassurance of my touch on her back to guide her across the yard and up the path. To keep her connected to me. To guide her home. For weeks, we had been spending a good part of our evenings in this way. I called her. She crawled, inch by painful inch, toward where I sat on the floor with my hand outstretched, palm up. She was only a few feet away, but the effort — not so much of dragging herself along on her belly as resisting the urge to run and hide — exhausted her. She paused now and again to pant and cry. I kept my face carefully averted, my body relaxed, my voice quietly soothing and encouraging. She would get close enough to allow me the barest of gentle touches before dashing away, trembling and drooling in her terror, before summoning the courage to crawl toward me again. Sachi, my Golden Retriever, laid nearby, anxiously watching our slow progress. Her faith in me was complete, so she was confused by this fearful dog. Didn’t I make sure they had plenty of fresh water and food? Didn’t I frequently and freely give belly rubs? Didn’t I take them for long, daily walks? Why was this dog so…broken? I glanced at Sachi from my position on the floor. Her soft, brown eyes were bright, pleading. Fix it, they said. You know how to fix everything. Please, please fix this. The problem was that I wasn’t sure what, exactly, I was fixing. Coyote had come to Sachi and me as a rescue. For several months her rescuer, Chris, had seen her chained to a porch, with no shelter from the elements and a hard-packed circle of earth indicating that she’d been tied there for some time. As the months went by, that suspicion proved out: Rain, sun, or snow, the little grey-brown dog was there, stoically enduring her exposure to the open sky. The house she was tied to was dilapidated, emanating an air of stagnant desperation, as though its inhabitants had simply given up. Sometimes small children played in the overgrown yard, as dirty and shabby as their home. Then one day something felt different about the place. The dog was still chained outside, but something felt…off. Another day went by, and another, before Chris noticed the gaping front door, swinging on its hinges, and the realization hit her: The inhabitants had abandoned the house, along with many of their possessions. The dog lying on her packed circle of dirt was one of those possessions. Chris cautiously gathered up the half-starved, dehydrated dog and took her to get help. At the veterinary clinic, they cleaned her up, finding that, beneath the grey-brown filth that matted her soft fur, she was a glowing white, with a faint tan streak running down the length of her back. Her ribs protruded and her pointed, velvety ears were scarred by fly bites. When they spayed her, they found she was pregnant. She was terrified of men. And, even after five months of being loved back to health by Chris, she was also terrified of me. I don’t know her full story — no one really does. All I know about is where our stories co-mingled. I know that, despite her fear — her certainty that, when she finally arrived at the place on the floor where I sat calling her, a terrible, dangerous trickery would occur — she continued to crawl toward me. I could imagine all kinds of abuse. I could tell myself that her neglect was intentional, that leaving her behind was an act of cruelty and not — as it might have been — in the hope that someone would find her and feed her because the family could no longer afford to. I could believe that the chain that bound her was a mean-spirited choice and not a landlord’s mandate. 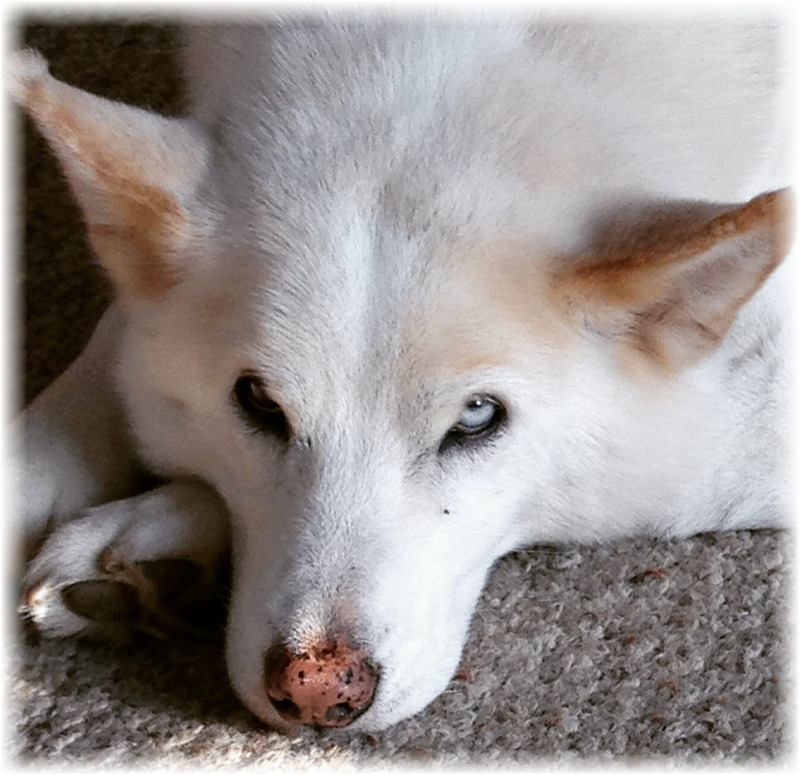 Or I could simply celebrate that, all those years ago, this pretty little husky trembled and whimpered and dragged herself — just one more time, sweetie — toward the love she saw me lavish on Sachi, toward the bond Sachi so badly wanted to offer her, toward the new life we both wanted to wrap around her as a sanctuary. Whatever she might have suffered, she was still willing to be vulnerable. It wasn’t easy, but she was trying so very, very courageously. It was months before Coyote learned to trust me. There were times I wanted to give up on her. But there was something in her eyes — that heartbreaking, beautiful hope — that made me keep trying. And the day eventually came that she greeted me at the door with her sister, wagging her tail and smiling up at me. We fixed it, Sachi. You and Coyote and I fixed it. The snow lays over the gardens, still and silent and sparkling under the moon. It is late. And cold — about ten degrees below zero. We are trespassing here at this deserted hour. I breathe in and feel the frozen air bite my throat and lungs. The girls run off-leash, a rare luxury in the city and a fine-able offense. I chose this frigid hour carefully so that our secret would be safe. I love to watch them run. Sachi streams over the drifts of snow, and my breath catches at her fluid beauty. She’s a puff of gold-grey smoke flowing across the field, her nose to the ground. Sometimes she lifts her head and stretches her body and legs to their full lengths as she flies over the landscape, her beautiful, long fur streaming in the wind. Coyote trots more than runs, her bottle-brush tail held high at the alert. She pauses to sniff delicately at the base of a bush, and her tail relaxes a little as she paws at the ground to get a better concentration of scent. In a fit of humor, Sachi swoops past her, jostling her a little, and she’s caught up in the swirl of her sister’s dash. I watch as Coyote takes off after her, transformed into a white shadow against the white background of the snow. Coyote is more nimble than her Golden sister, and she turns sharply, leaving Sachi scrambling to change course and catch up. Coyote’s ears are laid back, her eyes slits, and her jaws partly open in that Husky grin that makes me laugh aloud. She springs to one side and twists, facing Sachi, then pounces on her — and away again — with breathtaking speed and grace. My two dogs laugh and play together, and I think: This is what it looks like to be wild and free and joyful. It’s not the crash that wakes me, although I’m sure there was one. It’s the scrabbling of claws and the sound of water splashing across the tile floor and off the walls. I throw back the covers and reach her in three strides, knowing Coyote is panicked. When I flick on the bathroom light, I find her splayed out, one of her hind legs twisted beneath her and a front paw reflexively clenched and caught in the water bowl from which she’d been trying to drink. Her eyes are wide, dilated in terror, and she’s panting hard as she struggles to free her paw and untwist her hindquarters. I crouch down, gently wrapping my arms around her belly and pulling her to her feet. I feel every rib, every vertebrae in her frail body, as she kicks her hind legs and continues to thrash in my grasp. I murmur soothing words to her, trying to calm her as I slowly guide her from the tile to the carpeting, freeing her front paw from the bowl and rearranging her limbs for her until she’s standing on her own. She’s shivering and soaking wet, and my heart breaks open. She bumps her nose against the gate that contains her and her brother, Bodhi, in the small area — hall, bathroom, and bedroom — where we all sleep. She clearly wants to go outside. I lift the gate and help her navigate to the back door, then down the two low steps to the yard. She simply stands there, dazed and trembling, panting in the thick summer air. Once again, her dying body has betrayed her. My mind flashes to that winter night in the garden, watching her leap and dash like a diminutive wolf at play, with a sister who left us years ago. This is what this looks like, I tell myself for the hundredth time. This is what it looks like to grow old and sick and weak. I let her stand there for a few minutes, gathering herself. When her panting slows, I call her name softly, and she turns and totters over to me and lets me guide her slowly, patiently back to her bed. and practice not giving voice. and practice not tasting food. and practice not waking up. and practice not being found. and practice not seeing her cry. 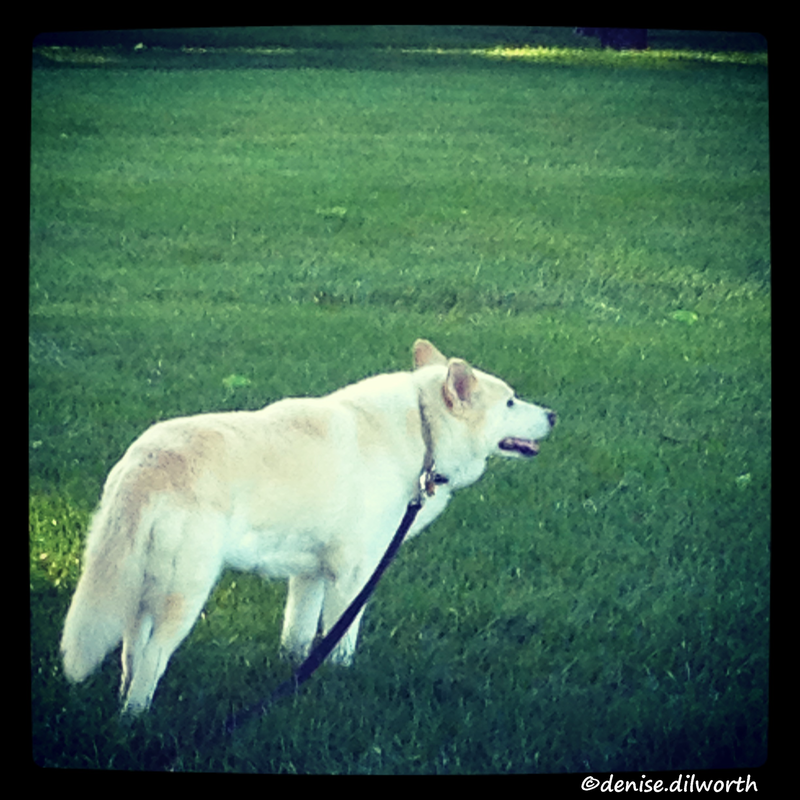 Categories: Unstructured Poems, Walking with Coyote | Tags: canine teachers, Coyote, grief and growth | Permalink. Coyote is sleeping now, and I’m resting more easily as I watch her draw slow breaths in then let them out in a puff that moves the bits of hair clinging to the cushion on her bed. I’ve been struggling for weeks now with what to feed her. She’s always been a tad finicky about food, clearly communicating what she doesn’t want or her body doesn’t need but only getting me to understand what she does need with great difficulty, if at all. Now, as the renal failure incrementally shuts down the rest of her systems because of the toxins building up in her body, I find it harder and harder to navigate the path between allowing her to die on her terms and simply giving up on her. Months ago, when it became clear that this was the last leg of her journey, I committed to allowing her to choose her own way. Sachi, the Golden Retriever we lost to cancer over two years ago, had no such choice. Her final diagnosis came at a crisis point, and the only clear path was to end her suffering as quickly as I could. With Coyote, I’ve had the luxury of time, a double-edged sword that has forced me to surrender by tiny degrees to her death. 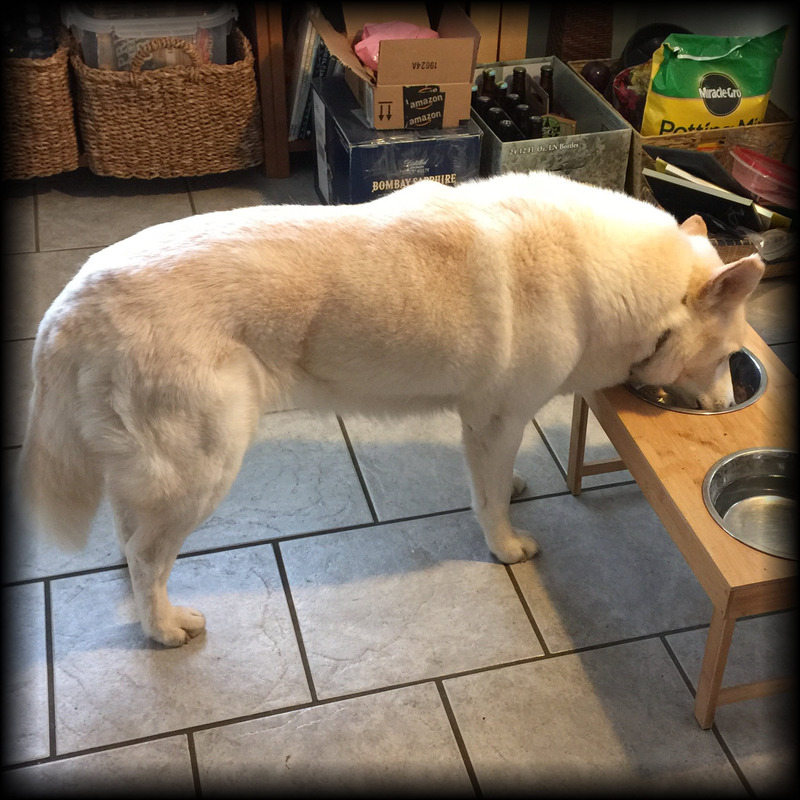 Several weeks ago, she started refusing to allow me to give her the subcutaneous fluids — electrolytes — that had been flushing her system over the course of several weeks. Rather than hold her down to administer them, I set them aside, offering them to her now and again, in case she’s changed her mind. I’ve gotten a clear “no” every time. Although they provided her relief while she took them, she will no longer come, lie down quietly, and patiently wait for them to drip into her body. She is done with that. The food has been harder. At first, it was a matter of hand-feeding her. Sometimes it would take a couple of tries, holding a morsel out to her to take and mouth and spit out — holding it out again so she could repeat the process until her appetite had been primed and she could chew and swallow it. And the next one. And the next. Lately, though, even that hasn’t worked. She still comes to the bowl when I call her, but she merely sniffs the food, then turns her head and walks away — only to return after I’ve cleaned up, looking for something…else. I’ve moved from canned dog food to human food. Roasted chicken, pot roast with gravy, lamb. I’ve tried anti-nausea drugs, antacids. But for several days, the most I could get her to take was a mouthful or two before she walked away. Was this the last throes of the disease claiming her life, the final destination — refusing nourishment as she prepares to leave us? I agonized. She still wants to take walks. She still wags her tail and smiles at me when she sees me. She still has life in her. But what else could I do? Where was the line drawn between letting my dog go and starving her out? As we slowly continued down the street, a neighbor stopped us to pet Coyote and ask after her. I told her about Coyote’s long fast and about the strangeness of her taking the mailman’s salmon treats. “Cat food,” Mary Lou told me. “Give her cat food. Cats are finicky eaters, so they make it extra-stinky. I did that with my Patsy, and it bought us a little more time.” I dropped Coyote at home and set out to buy cat food. Salmon, three cans of it. Coyote licked the bowl clean after the first can and ate half of the next. This morning, she ate the rest. Deep gratitude has buoyed me. I can accept Coyote’s decline. I can accept it when she clearly communicates that she doesn’t want or doesn’t need something. I won’t force anything on her. But the fear of missing something, of misunderstanding drives my pain and angst. We are doing the best we can, Coyote and I. For now, cat food. Tonight, my Better Self has fled me. 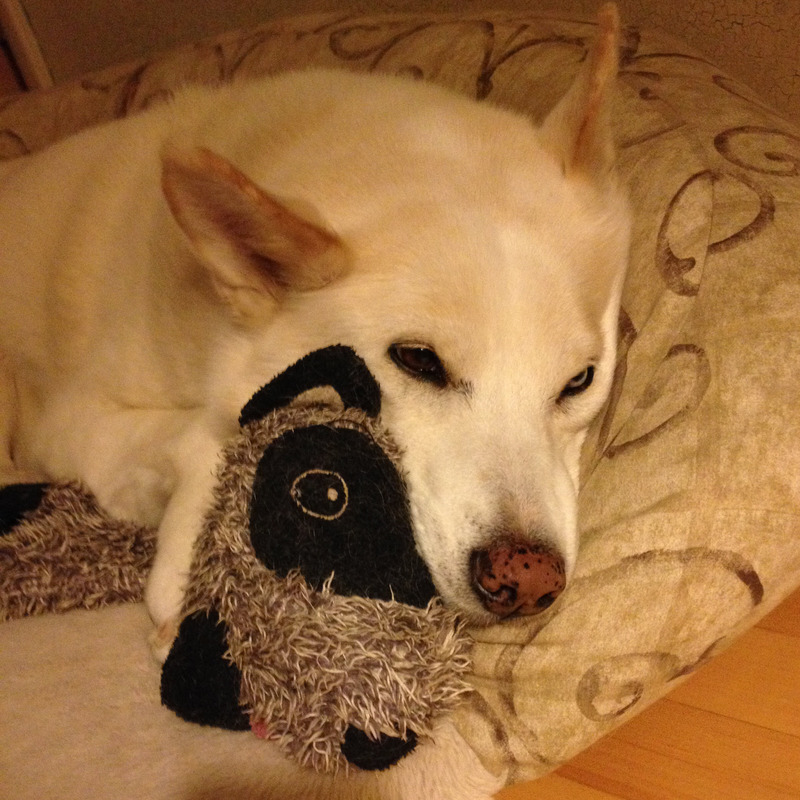 I’m tired and frustrated and — yes — even resentful of my terminally ill Coyote. I’m cleaning up several messes a day — urine, vomit, feces — from everywhere in the house, even the porch. Despite my best efforts, putrid bodily waste is embedded in the carpeting, seeped into the wood, soaked into the grout between the tiles. After weeks of this, it feels impossible to keep up with cleaning the filth from the floors, washing the dirty rags, and I’m not sure how much longer I can continue. But I shatter under the weight of what it would mean not to continue. The burden of Coyote’s care robs Bodhi of meaningful play time with me, steals the space I might create for caring for myself. Relief from that burden, however, means never seeing her smile in that way that huskies do; never again watching her curl into an “O” while she sleeps, with her nose buried into the end of her tail for warmth. Yes, the time I spend crouched next to her bowl, feeding her one piece of baked chicken at a time — and, at the start of a meal, re-feeding her the same piece again and again until she can get her mouth and tongue and throat coordinated — could be spent doing yoga in the morning or reading in the evening. But not crouching there, patiently helping her swallow the last kind of food she can stomach, would also mean missing the uncharacteristically demonstrative way she leans her head into my chest when she can eat no more, an apology and a surrender. She knows it hurts the heart she feels beating through my t-shirt to see the weight melt from her frame. I can see the structure of her body too clearly now, the skeletal scaffolding that was once hidden by muscle and flesh and her thick, still-beautiful, white pelt. And, yet, she’s in no pain. So I can’t simply “dispose” of her for my convenience. She still finds pleasure in lying in the sunbeam that warms that one spot on the living room floor. She still wants a belly rub if I’m passing by. She still begs for walks, even if all she can manage is halfway up the block before her weakened, clumsy limbs betray her, and we have to turn back. She still owns a quality of life that keeps me in this holding pattern with her. Still, I hate myself for gating her in the kitchen, where the tile is easier to clean, but where she can’t watch the squirrels from the windowed front door. I hate the disease that is slowly wasting her away, stealing the comical nimbleness and focused stealth she used in her play, so long ago. I hate the brevity — only 11 of her 13 or 14 years — of the time we’ve had together. It’s exhausting to keep trying for her. It’s anguish to understand what it means to stop.